I like relating fun to autism education and like this article by Mari Nosal Quite a bit. 2) Homemade colored glue: Provide each child with a small disposable bowl, glue, a spoon, and several drops of food coloring. For younger children, you may ask them which colors they choose and squeeze the drops in their bowl. But do let even the littlest kids stir the gluey mixture independently. They gain pride from this. (I am a strong proponent of letting the kids do projects as independently as possible) The messier the better!! Mess means fun. Stir the white glue and food coloring together. You can be inventive by adding glitter, etc. Provide alphabet stencils and encourage the children to trace names, stop signs, etc. 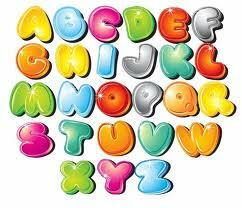 Fill in the letters with the colored glue creation. Decorate with yarn, macaroni, the kids are only limited by their imagination. Let the crafting begin!!!!!!! 3) Treasure map: Have children cut the edges of a piece of paper. Soak in black tea for a couple of hours. Remove from tea solution and let the paper dry overnight. When completely dry, the children can draw a treasure map on their pirate map. The may hide items for other children to find and switch maps for lost Bounty. (provide stickers, erasers, etc. for the children to hide according to where X marks the spot on their map: As fun as this seems, it enhances spatial relations, sequencing, and processing skills. The children are hard at play but hard at work as they must process the maps to hide and find their coveted bounty. 4) Shaving cream spelling bags: Assist the children in inserting a minute amount of shaving cream in a ziplock baggie Make sure to fill the bag with shaving cream no more than a third. Put several drops of food coloring in the baggie. ALWAYS MAKE THE FOOD COLORING CHOICES THE CHILDS. This provides them with positive self-esteem and gives them a sense of ownership when they are consulted on their project. After all, it is THEIR project not ours. We merely coach and assist. Seal the baggie and place a second baggie over the first sealed one. Then seal the bags edges with duct tape. This reinforces the bag and guards against leaks and tears. Place bags on a table and encourage children to trace their name, letters, words, etc. with their finger on the outside of the bag. If the bag was not overfilled children will be able to see their letters on the bag. Be the first to comment on "Fun Curriculum Activities to Enhance Literacy By Mari Nosal"